Photo courtesy of Grab Bag Studio. From left: Stephanie Libanati, Kelly Hamilton, Brittany Mojo, Shea Vititow and Natalie Mik. A new contemporary art collective, studio and exhibition space has opened in Long Beach’s Eastside area by the name of Grab Bag Studio. What looks like an unassuming storefront window rewards those curious enough to step through the door of 2626 East 10th Street with a surprising and wonderfully chaotic explosion of color and creativity. Vititow, who has occupied the space since May using it for her own practice, had the idea to open it up to four friends and colleagues from the art community. The painter acknowledged that while many of them show and sell art in Los Angeles, they were also local to Long Beach. “A lot of us drive up and commute to LA to show and do our work, but then we’re all here,” said Vititow. 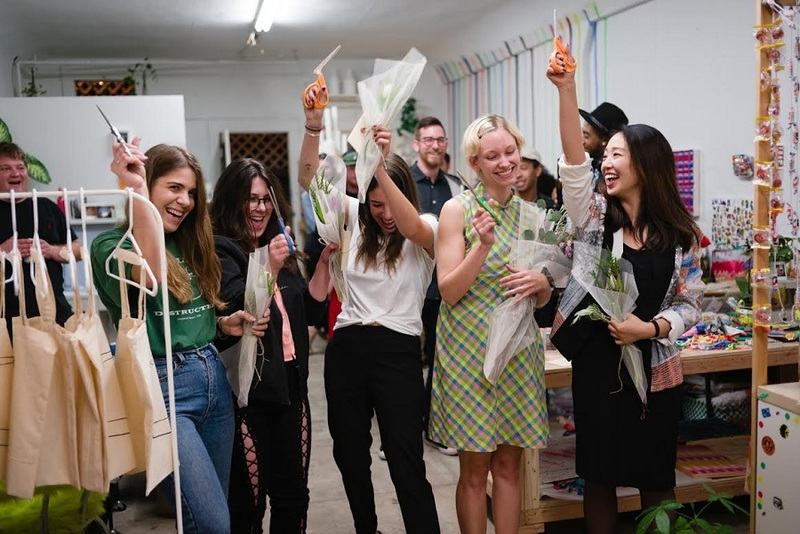 “[…]Bridging the gap between Los Angeles and Long Beach and hosting events and coming out with a program that really draws from the community, was something that we felt very strongly about,” Mik added. Photo by Asia Morris. Work from the Transparent Memory Booklet Workshop with Sara Chao earlier in February. The space is organized to highlight the artist’s process alongside current exhibitions. The decision not to hide the studio space where the collective works, or clearly separate the studio space from the gallery, was intentional and a way to give access to contemporary art from a slightly different perspective than how a more traditional gallery space would operate. The two artists showing in Grab Bag Studio’s first exhibit, Sara Chao and Michael Nannery, were encouraged to experiment and try new things, as will each future artist who participates in an exhibition. At Grab Bag, it’s as much about the process as the end result, where artists can come in to try things that they haven’t been able to previously. Photo by Asia Morris. Detail of Sara Chao’s installation, Sari-Sari Store. Chao’s installation, Sari-Sari Store, is a site-specific work representing a traditional Filipino neighborhood convenience store, a work of art inspired by the passing on of her grandmother who ran one herself. Nannery’s exhibit, Breathing Together, supported Grab Bag’s mission to incorporate community. An artist and curator living in Long Beach, he rearranged the work to fit the front gallery space, a group of varying houseplants all contained in vessels made by other artists. Image courtesy of Grab Bag Studio. The closing reception for both exhibits, which you can read more about here, will take place on Saturday, March 4 from 5:00PM to 8:00PM. Check out the Facebook event page here for more details. The name Grab Bag Studio includes two aspects of the actual definition of the term. The first, “a container from which a person chooses a wrapped item at random, without knowing the contents,” fits the collective’s mission of offering an element of surprise to visitors. The second, “an assortment of miscellaneous items,” described the studio’s policy to focus on creating and welcoming a diverse community to the space. The five founders certainly fit the description of a miscellaneous assortment, as well, with each having her own unique practice. Mojo is a sculptor and ceramicist, Mik is a curator, performance artist and sociologist, Vititow is a painter, Hamilton is a photographer and web designer and Libanati is a printmaker and seamstress. How the group works together in such a small space has been a learning experience, but in the month since the studio officially launched, they’ve been able to glean only positives from the decision. “It’s important for me to say that there’s this kind of myth around the solitary artist…,” Mojo said. “We like that, too, but we thrive on being alone together,” Vititow added. “Or just having another eye to [look at your work], having that fluid conversation that surrounds your practice is something that I haven’t had since school,” Mojo said. “[…]When people come together and share their thoughts or work together[…] it’s mind opening sometimes and you see the world, you see your own art practice from a different perspective and that’s very nurturing for yourself and for the other person, too,” said Mik. 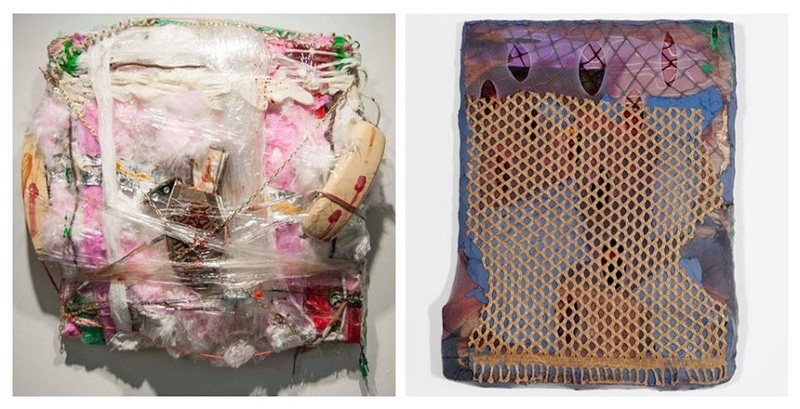 Grab Bag’s next exhibition will feature works by Baltimore-based mixed media painter Matt Wolf and New York-based installation artist and painter Leeza Meksin, on Thursday, March 16. For more information, visit the event page here. “Grab Bag is kind of an art project in itself,” said Mojo, and the entire community is invited to be a part of it. For more information about Grab Bag Studio, including workshops and upcoming exhibitions, visit the website here and Facebook page here. Grab Bag Studio is located at 2626 East 10th Street.